Drummer Klaus Agerbo and bassist Peter Bruun meet in Esbjerg, Denmark and soon find that they share a great passion for old school 80's heavy metal. They decide to start a band based on that stile, and joined by guitarist Søren Steffensen, the trio starts jamming old 80's metal stuff.Singer Lars Märker joins the band in 2006, starting out playing rhythm guitar as well. This completed lineup starts writing their own songs, and quickly develop a clear musical profile. 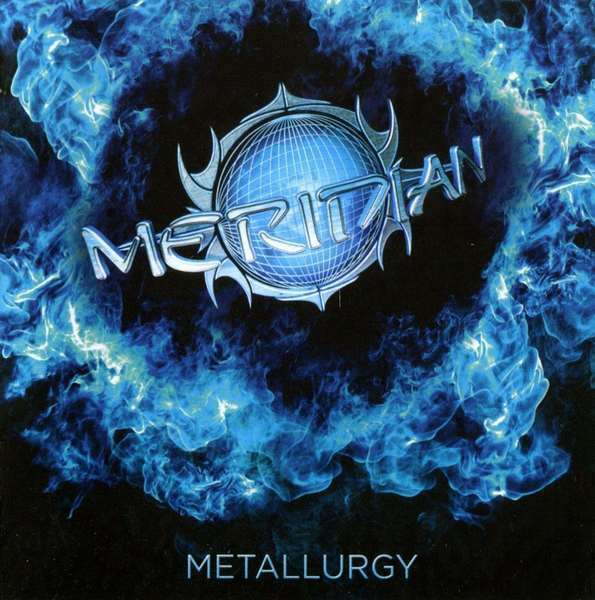 - Classical heavy metal with power and melody.On a long list of potential band names "MERIDIAN" seems to be the one that perfectly match the band and its musical direction. By March 2007 the band enters the studio to record the first EP, "All The World's A Cage", containing four of the early songs written by the band. Soon after Lars wants to concentrate on his singing, and the band decides to recruite another guitar player, making it a quintet for the first time. First up was Sørens brother, Torben Steffensen who stayed for a year, then beeing replaced by ”JS”. - In 2008 the band takes some time out building its own recording studio in the rehersal place, and in the summer of 2009 releases the second EP, ”Inside The Machine”, produced and recorded by the band itself. The release is celebrated by playing a couple of gigs, but shortly after, Søren decided to leave the band for personal reasons. A replacement was found in local guitarist Steffan Pedersen, and the band continued gigging locally for a while. 2010 was spend writing and demoing songs for the next release. By the end of the year, 10 songs were ready for a full album release, so in early 2011 the band started recording the debut album, again producing and recording themselves at home in the rehersal place. The work was done in the early summer, and the band took a good listen to the result. The common feeling was that it sounded good, but it didn't sound great. The decision was made to start again from scratch. Everybody had great faith in the songs, but agreed that they deserved a better production. However, this prompted yet another lineup change as JS decided to leave the band. A new guitarist was found in young talent, Mads Bahl, and the band took some time off, just jamming and regaining the joy of just jamming together, after a long period of recording. A show was played in the summer, and then it was back to work again. Ditching the DIY idea, the band entered CB-Studios where the first EP was also recorded, and the album was produced and mixed by Christian Bonde. During the mixing phase it was lineup adjustment time again. Mads was out and in came an old friend of Klaus', Martin J. Andersen, - a very talented player, known from his own bluesrock band, Blindstone, and various other projects. Martin provided solos for five songs on the album, which was then mastered by Jacob Hansen at Hansen Studios, and finally, by early 2013 it was done, and the band went looking for a record deal to get the album released. In 2013 the band signed with the danish label, Mighty Music, and the debut album, titled ”Metallurgy”, was released in december. It received a lot of great reviews, and the band played a handfull of shows around the country. A video was made for the song ”Between Love And Hate”, which gained the band some attention. In the summer of 2014, the band went into the studio to re-record a new version of a song from the second EP. The song, ”The Bravest Face” was written in 2008, with lyrics by Klaus about his nephews fight against leukemia. He beated the disease twice, but in 2014 it came back again, and the band decided to re-record the song as a tribute to his ongoing fight. Sadly he lost the fight and passed away in the autumn. A few weeks later the song was released as a digital single, with all income going to the danish cancer foundation. The single contained two versions of the song, - the full band version and a stripped down piano version, played and sung by Lars. In December 2014 the band had the first writing session, working on new ideas for songs for the next album. This work continued in the first half of 2015, and in august the band checked into Hansen Studios to record the second album. Compared to the three years it took to make the first album, the recording process this time was quite the opposite. All the music was recorded in just four days with vocal done at various sessions the following months. The album was produced, mixed and mastered by Jacob Hansen. Soon after the recording of the album, Steffan decided to leave the band for various personal reasons. A replacement was found in the talented Italian guitarist/producer, Marco Angioni, who runs his own studio, Death-Island Studios, in the north-western part of Denmark. The new lineup quickly proved itself as the most harmonic and best Meridian incarnation, and in the spring of 2016 the band won a local competition and got the job as openers of the main stage at Esbjerg Rock Featival. At the same time the first single of the new album, the song ”City Of Holy War”, was released digitally together with a new music video. The song got a lot of airplay on the danish radiostation MyRock.The new album, entitled ”Breaking The Surface” is released 16th. September 2016. 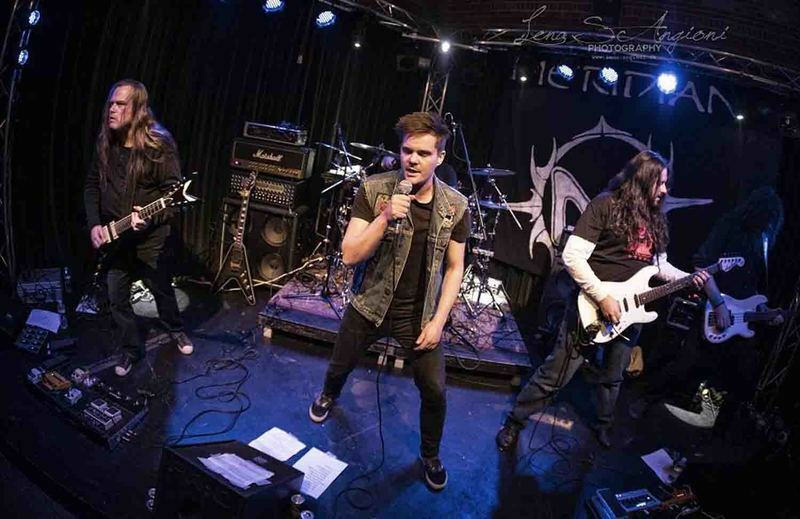 MERIDIAN is Heavy Metal band from Esbjerg, Denmark founded in 2005. They have released 2 EPs "All the World's a Cage" of 2007 and "Inside The Machine" of 2009. Their album “Metallurgy” is about to see the light of day really soon.“Introminator” commenced the band’s attack with a decisive piece of Metal, a splendid intro to let your head roll. My favourite track is “Between Love and Hate” where the skins pound mercilessly with excellence, melodious heavy weight riffery, ultimate catchy chorus with uplifting melodic singing Melodic providing a mixed sense of Heavy and Power Metal. “Human Price” charges with fast tempo stampede, having you memorizing its peak chorus moment, striking it as a tuneful song. 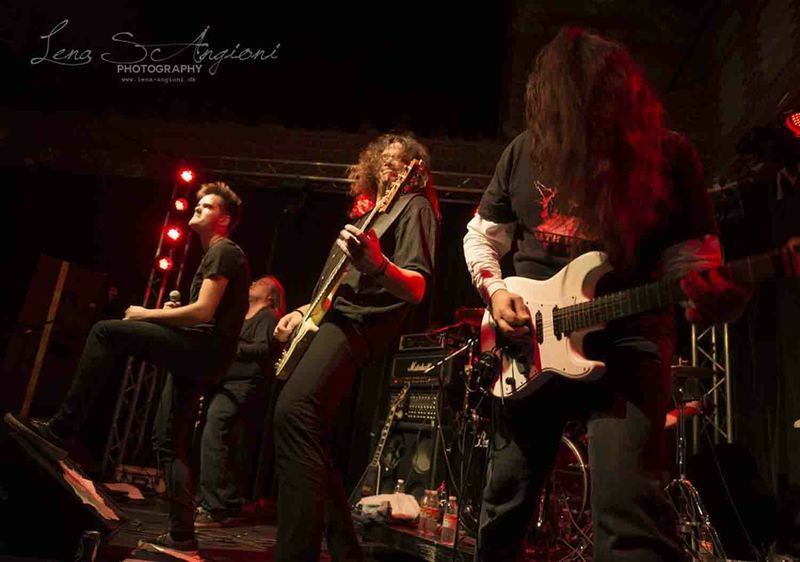 “My Enemy” is a sort of an epic Heavy Metal track, garnering many influences while appearing similar to the robust energies of PRIMAL FEAR. On the other hand, the guitaring, whether meaty or atmospheric, show evidence of impressive ideas, like drilling hard into your soul bearing influences of DIO and BLACK SABBATH but with modern inducements. “Only the Strong” is a continuance of what I just described The band’s tightness and sound are a kicker while also proving that there is a damn well made frontman singing the tunes with plenty of emotive flashes. “Frozen in Time” and “The Machine” are mechanized warmongers with a pounding rhythmic section while “Seeking Immortal Life” distributes the old JUDAS PRIEST feel & fantastic melodic singing, yet mixed with a bellyful of AOR. 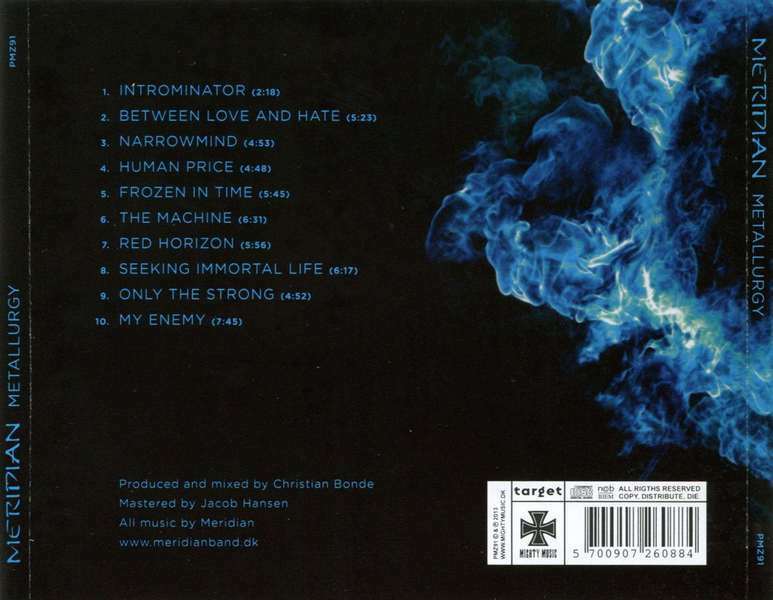 Worth to listen are also: “Narrowmind” with heavier Rock riffs, energy & changes rate finding IRON MAIDEN and melodic riffs with diverse signatures on “Red Horizon”.MERIDIAN play fantastic Heavy Metal with catchy melodies, impressive guitar riffs, incredible solos and on hell of a vocal line. Heavy Metal received a wonderful version with their offering. This band is really interesting. Highly recommend for every fan of melodic Heavy Metal. I'm looking forward on their new songs in the future and wish to see them one day on stage on gig. Possibly that I feel for their music, they got themselves a new fan.